I use a bunch of different apps for taking notes, recording voice memos, and managing my schedule, so I’m always ready with a suggestion if someone asks me what they should use to get organized. But if you don’t care to cram your phone with productivity apps and still need a way to remember stuff, there’s one you should definitely try. 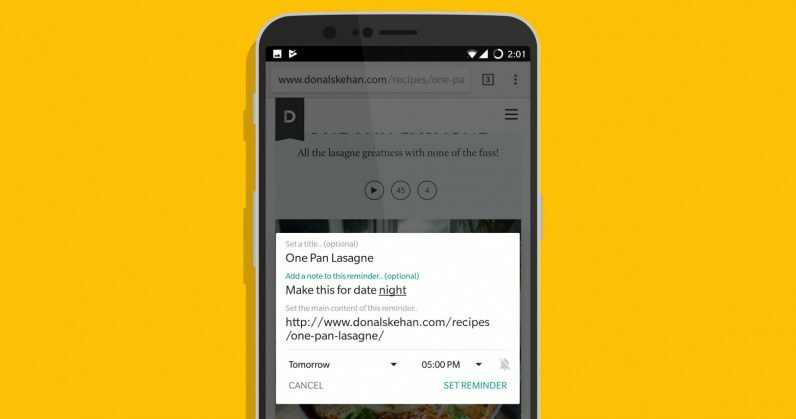 Remindee for Android lets you create reminders from any app that lets you share content – whether that’s your Reddit client, web browser, or online store of choice. Just hit the ‘Share’ button, or select text or an image and share it to Remindee, and you’ll be greeted by a pop-up that lets you set a time to be reminded of said content. I found it handy when saving recipes I intended to cook later in the week from my browser, as well as with articles I wanted to read later, and with information about events in my city that I wanted to check out. After you’ve added a reminder, it’ll show up in a list in Remindee, where you can archive or edit it if necessary. Of course, you can do the same thing with Google Keep (and access your content from various devices), but if you’re not already in the habit of using the company’s note-taking tool, it may be a bit much. Instead, Remindee offers a dead-simple way to stay on top of things you come across on your phone. The app is completely free, and has no ads or in-app purchases. Give it a go by grabbing it from Google Play.